In my last post, I examined the number of "active requesters" on Mechanical Turk, and concluded that there is a significant decline in the numbers over the last year. The definition of "active requester" was: "A requester is active at time X if he has a HIT running at time X". A potential issue with this definition is that an improvement in the speed of HIT completion (e.g., due to increased labor supply) could drive down that number. 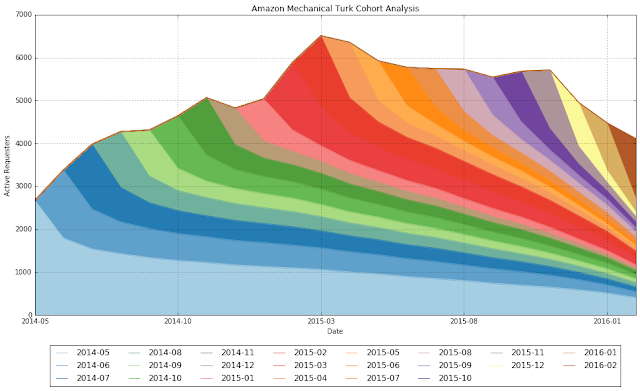 For this reason, I decided to perform a proper cohort analysis for the requesters on Mechanical Turk. In the cohort analysis that follows, we will examine how many requesters that have first appeared in the platform on a given month (say September 2015), are still posting tasks in the subsequent months. For example, the bottom layer corresponds to all the requesters that were first seen on May 2014 (the first month that the new version of MTurk Tracker started collecting data). We can see that we had ~2700 "new" requesters on that month. (The May-2014 cohort obviously contains all prior cohorts in our dataset, as we do not know when these requesters really started posting.) Out of these requesters, approximately 1700 also posted a task on June 2014 or later, approximately 1000 of these have posted a task on March 2015 or later, and approximately 500 have posted a task on February 2016. The layer on top (slightly darker blue) illustrates the evolution of the June 2014 cohort. By stacking them on top of each other, we can see the composition of the requesters that have been active in every single month. As the plot makes obvious, until March 2015, the acquisition of new requesters every month was compensating for the requesters that were lost from the prior cohorts. However, starting March 2015, we start seeing a decline in the overall numbers, as the total decline in requesters from prior cohorts dominates the acquisition of new requesters. So, the cohort analysis supports the conclusions of the prior post, as the trends and conclusions are very similar (always good to have a few robustness checks). Of course, a more comprehensive cohort analysis would also analyze the revenue generated by each cohort, and not just the number of active users. That requires a little bit more digging in the data, but I will do that in a subsequent post.